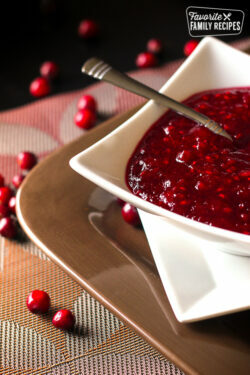 This Cranberry Orange Sauce tastes SO much better than anything you can buy in a can. It’s really easy to make your own and it has so much more flavor! 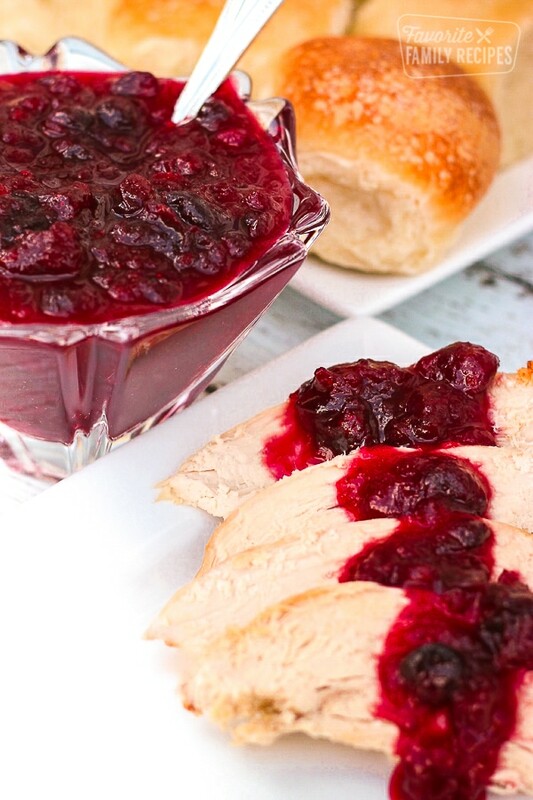 This Cranberry Orange Sauce is delicious on turkey and rolls. It tastes so good and smells so good that I have to discipline myself not to just eat it right out of the pan It has a zesty, tangy flavor. I love it served warm, but cranberry sauce is traditionally served chilled which makes this recipe one that can be made ahead and stored in the refrigerator for at least a week before a holiday dinner. This is a fun recipe to get help with from you family. When the cranberries heat up in the pan they make a hissing noise just before they pop. When all of the cranberries “pop” or split open the sauce starts to thicken. With only a few ingredients, this sauce is inexpensive to make. I watch for fresh cranberries to go on sale, buy a bunch, and freeze them right in the bag in my freezer, then pull them out when I want to make cranberry sauce. This sauce is a great gift for neighbors and friends during the holidays. Pour the sauce into decorative jars, keep chilled, and add a bow! If you are looking for another tasty cranberry sauce recipe to make at home, click here for our Raspberry Cranberry Sauce recipe. If you have leftovers, this sauce can also be used as the base for our Cranberry Vinaigrette Dressing. 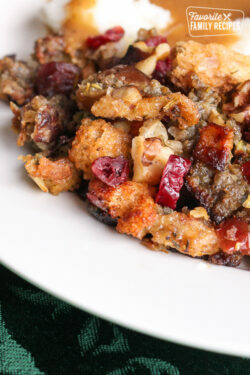 Some other cranberry recipes that we always are making over the Holidays are our Cranberry Almond Bread with Cream Cheese Swirl for breakfast, our Cranberry Salsa for a yummy appetizer, and our Cranberry Chicken and Cranberry-Sausage Stuffing are perfect for Holiday dinners. 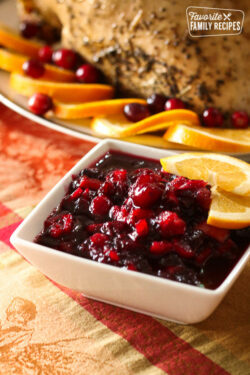 This Cranberry Orange Sauce tastes SO much better than anything you can buy in a can. It's really easy to make your own and it has so much more flavor! Bring to a boil, stirring occasionally. You will see the cranberries soften and hear them begin to pop. Serve warm with turkey and rolls. 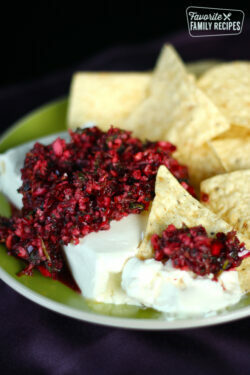 If serving chilled, pour sauce into a dish or jar and cool at room temperature. Once cooled, refrigerate until ready to serve. We made this yesterday for Thanksgiving and it was delicious!!! I made the raspberry cranberry sauce last year, which is also fantastic but I like not dealing with The Raspberry seeds. I did add an extra cup of sugar bc I like it more sweet. My mom also added some chopped walnuts…that’s how I like it! Oooh – yum! What a great idea! Absolutely! It is good cold or warm. You can reheat it in the microwave or on the stovetop. Do you mean orange juice bought or fresh squeezed oranges? Store bought or fresh squeezed will both work fine in the recipe. Use what is most convenient for you. Thanks for asking! This is so good! I made it for Thanksgiving and for a Christmas work thing, and it was recieved with great fanfare! Great recipe! I’m so glad you like the recipe, Marisa! It is my absolute favorite cranberry sauce. I make it every year for Thanksgiving and Christmas. I love it on turkey and rolls. I absolutely love this recipe. it is so very easy and delicious. I like to make it 2-3 days ahead of time. I think it tastes better the longer you let the flavors meld. Thank you for sharing. I can’t wait to try this recipe! I’m always worried about trying new recipes on Thanksgiving! I’m so glad you can make ahead! I read one of the reviews where she said its better when left in the fridge for a couple days! Perfect! It should stay good for a couple weeks. You can also freeze it if you needed to! An online friend said she adds two Gala apples to this, as well as cinnamon and nutmeg. Yum! That sounds amazing! Thank you for sharing! I want to make this sauce for Thanksgiving this year, and I am also making another recipe that calls for cranberry sauce to be used in it. I want to use this homemade sauce rather than store bought. I know the recipe says this makes 12 servings, but how large is a serving for this recipe? What would you say the total amount made is? 2 cups? 3 cups? Thanks so much! Its about 4 cups. I hope you like the recipe! It is one of my all-time favorites! I made it last Thanksgiving and cant wait to put it on my table again. All of the kids including my picky nephew were devouring it . They did not touch the can ones . Cant wait ! Happy Thanksgiving everyone! Yay! We are glad you like it as much as we do! Thanks for the 5-star rating and Happy Thanksgiving to you too!